Xperia Active is aimed at health conscious people. It helps them to set their ideal training route, realtime on-screen monitoring of heart rate and pulse, able to check day to day performance with iMapMyFitness app and can share your progress via. Facebook. It uses following technologies for all these- GPS, barometer and compass, ANT+ wireless networking. The Sony Ericsson Xperia Active has a 3 inch LED-backlit LCD capacitive touchscreen HVGA display that’s scratch resistant with Sony's Mobile Bravia display technology which sports a 5 megapixel camera capable of HD video capture. The Xperia Active is powered by 1 GHz processor with 512MB RAM and runs on Android 2.3 Gingerbread OS (update to Android 4.0 Ice Cream Sandwich soon) with Timescape UI. It has 320MB of usable storage and cmes with 2GB card bundled which can be expanded upto 32GB. Connectivity options of SE Xperia Active includes Wi-Fi 802.11 b/g/n, DLNA, Wi-Fi hotspot, 3G(download @7.2Mbps, upload @5.8Mbps), Bluetooth v2.1 with A2DP, EDR, EDGE, GPRS. Expansion options of Xperia Active includes microSD card slot, microUSB. Sensor options includes Accelerometer for auto-rotate, Multi-touch input, Proximity sensor for auto turn-off. 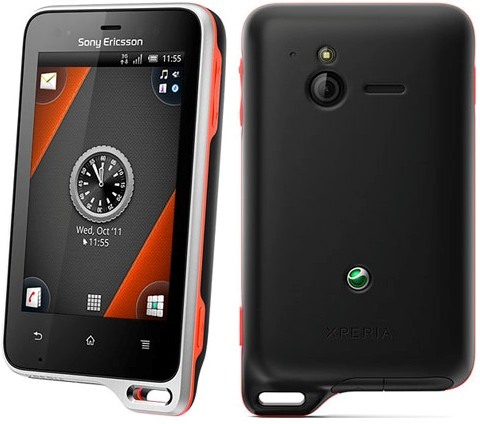 The Sony Ericsson Xperia Active is dust and water resistant and allows wet finger tracking. Other options includes changeable soft-touch back cover, detachable ear hooks, a wrist strap and arm case. The Sony Ericsson Xperia Active has a dimension of 92 x 55 x 16.5 mm and weighs about 110.8 grams. It is equipped with 1,200 mAh battery - not a nice one for a smartphone. It was announced in June during the CommunicAsia 2011 event in Singapore. Available in US currently for a price tag of $340 unlocked.It will be available in India soon. Tags: sony ericsson xperia active, se xperia active, sony ericsson active, xperia active, sony ericsson smartphone for health aid, water resistant phone,health-aid phone, mobile bravia display technology , sony ericsson xperia active, sony ericsson xperia active features, sony ericsson xperia active specifications, sony ericsson xperia active review, sony ericsson xperia active details, sony ericsson xperia active availability, sony ericsson xperia active specs, sony ericsson xperia active images, sony ericsson xperia active pics, sony ericsson xperia active pictures, sony ericsson xperia active imgs, sony ericsson xperia active price,sony ericsson xperia active network options, sony ericsson xperia active expansion options, sony ericsson xperia active multimedia features, sony ericsson xperia active sensor options, smartphones.